The Story of How West Hollywood Came to Symbolize LGBTQ L.A.
Home Uncategorized The Story of How West Hollywood Came to Symbolize LGBTQ L.A.
With its rainbow-colored crosswalks and blocks of out-and-proud bars and clothing stores, West Hollywood stands tall as the visible symbol of gay Los Angeles. When it became an official city in 1984 and established a majority-gay city council, it made headlines as America’s first gay municipality. But that alone doesn’t really explain how West Hollywood, a town of 36,000 residents, became the symbolic heart of LGBTQ L.A., a community whose own outlines stretch far beyond the 1.9-square-mile city. Adding to the Strip’s allure were such denizens as lesbian actress Alla Nazimova, who around 1919 moved into a mansion near Crescent Heights that became notorious for its debauched parties (she later transformed it into the Garden of Alla hotel). Director George Cukor, who lived above Sunset on Cordell Drive, threw Sunday pool parties that became a draw for “the glamour boys, the people who loved the glamour of Beverly Hills and the glamour of the Sunset Strip,” says Matt Tyrnauer, director of Scotty and the Secret History of Hollywood, an upcoming documentary about Scotty Bowers, who operated a male prostitution ring that catered to the city’s elite. From the 1930s, after Prohibition, into the 1950s, the Sunset Strip saw the heyday of famed haunts like Ciro’s, the Mocambo, and the Trocadero as well as the lesbian-friendly Jane Jones’ Little Club and the Venetian-themed Café Gala, where gay singer and co-proprietor Johnny Walsh held court. Movie studios, interior design firms, and fashion houses—which employed many gay men—sprang up in the area in part for their proximity to the wealthy residents of Beverly Hills and Bel-Air. In 1935, actor William Haines, who became a decorator after being blacklisted by Hollywood for refusing to hide his identity with a sham marriage, set up shop in the Sunset Plaza shopping district. Movie costumer Adrian established a couturier next to the Trocadero in 1938. Gay architect John Woolf, whose clients included Barbara Stanwyck, Cary Grant, and Bob Hope, located his studio on Melrose Place in the late 1940s. As he remembers it, West Hollywood-ites were initially resistant, at times even hostile, to the cause of gay liberation in the late ’60s and early ’70s. It wasn’t just about politics. There was a class divide as well. The stereotypes, largely true for the time, were that the gays to the east were more hippie, with long hair and beards, while the residents of West Hollywood were more clean-cut—what some called “sweater gays.” “West Hollywood thought it was a little bit too grand for the rabble-rousers of Echo Park and Silver Lake” is how Kilhefner puts it. Back then a freight train still rumbled down Santa Monica Boulevard at night. The street was dotted with auto shops, plating plants, and lumberyards—a carryover from when the area around the intersection of Santa Monica and San Vicente boulevards went by the name Sherman and was home to a power plant and rail yard. It was a street ripe for transformation. In the 1972 book The Gay Insider, a travel guide to the U.S., author John Francis Hunter referred to West Hollywood as the “very epi-center of gay activity.” Troy Perry moved to the area in 1975. “All at once bars had opened in West Hollywood by that time, and I could walk to the bars from my house. I didn’t have to get into my car,” he says. “To a gay man who was in his thirties, that was very important back then.” It was the era of the gay ghetto, not just in L.A. but also in New York City’s West Village and San Francisco’s Castro district. “Gay men in particular, and some gay women, wanted to live in areas that were largely gay,” says Faderman. So many businesses congregated in one part of West Hollywood that it became known as Boystown, a nickname that many think began as a joke by gay men referring to the 1938 film about a Catholic home for orphan boys, though the West Hollywood City Council historical survey deems it a derogatory term used by straight people. By 1975, the Cesar Pelli-designed Pacific Design Center had risen up on the site of Sherman’s old rail yards. 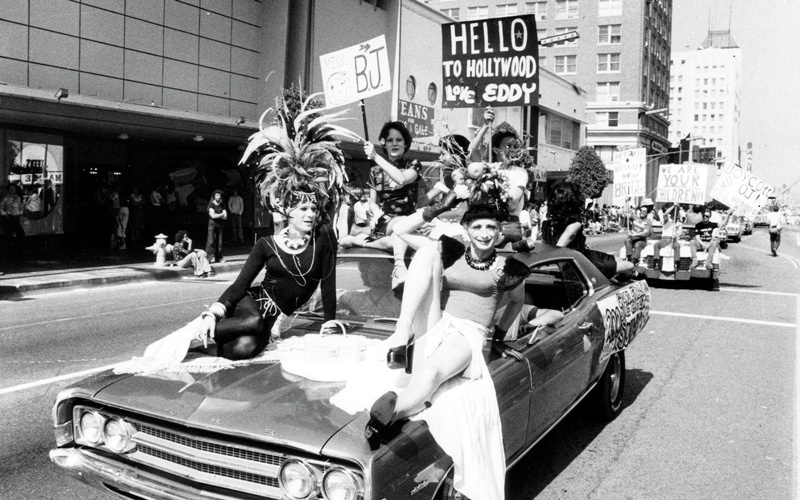 Four years later L.A.’s Gay Pride Parade would shift from Hollywood, where it originated in 1970, to West Hollywood. The push to incorporate the city in the decade that followed was initially spurred by economic issues. The county’s rent-control law was set to expire in 1985, an unwelcome prospect for an area in which 85 percent of the residents were renters. A coalition of Jews, the elderly, and gay men and women (the latter two composing an estimated 30 percent of the population) put cityhood on the ballot, and the City of West Hollywood was established on November 29, 1984. The progressive new city council, of which three of the five members were gay, swiftly instituted a rent-control ordinance, passed laws protecting gay residents and people with AIDS/HIV from discrimination (policies that are mainstream today), outlawed discriminatory practices against people of color that had taken root at some nightclubs, and brought down Barneys Beanery’s antigay signage for good. Some observers called the area a gay Camelot, the first city that gays could call their own. Wealthy gay political power consolidated in West Hollywood as well with the formation of the Municipal Elections Committee of Los Angeles, or MECLA, the only gay PAC of its kind at the time; MECLA’s breakfasts at the Bel Age Hotel became a must-stop for county and city politicians until 1991. So perhaps it is only fitting that a geographical realignment of established gay events is challenging the primacy of West Hollywood. Last October AIDS Walk Los Angeles moved from West Hollywood to a spot near Grand Park downtown. The move marks a coming home of sorts: In the early 20th century, downtown was the first L.A. neighborhood that had a significant gay presence, with Pershing Square Park a well-known meeting spot and a stretch of 5th Street known as “the Run” because its restaurants, bars, and coffee shops served a gay clientele. Last year as well, a group of organizers, responding to the swelling number of gay people living downtown, launched DTLA Proud in Pershing Square, the neighborhood’s inaugural gay pride festival. 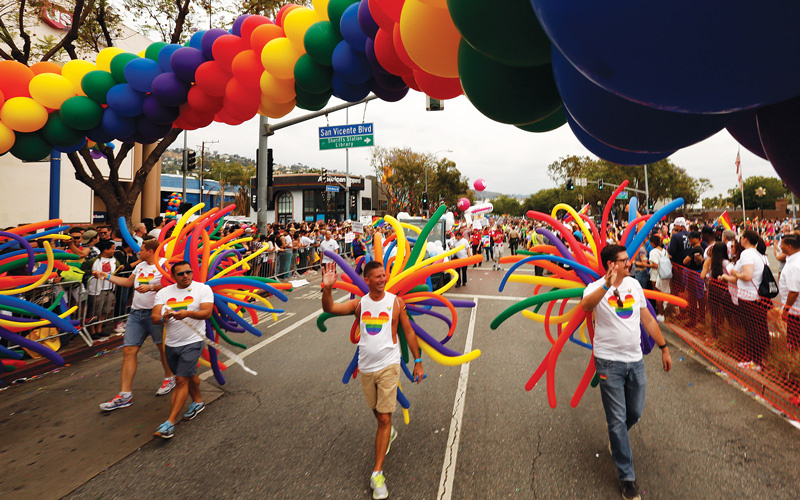 Drawing a few thousand attendees, it may not rival West Hollywood’s 150,000-strong L.A. Pride Parade & Festival (which is morphing into an anti-Trump resistance march this year), but it acknowledges something important: that there’s more to gay L.A. than any one set of borders.